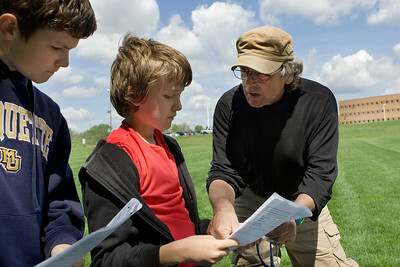 Mike Greene - mgreene@shawmedia.com Hannah Beardsley Middle School students Neal Schnoor and Mike Ostrow listen as David Rigby, education outreach coordinator for Friends of the Fox, explains the point scale for various critters Tuesday, May 8, 2012 in Crystal Lake. The event, organized by seventh grade biology teacher Carol Sevrey and Friends of the Fox, gave students a chance to gain hands-on experience and apply skills learned in the classroom. Students at the event measured the physical, chemical, and biological conditions at sites along the stream. 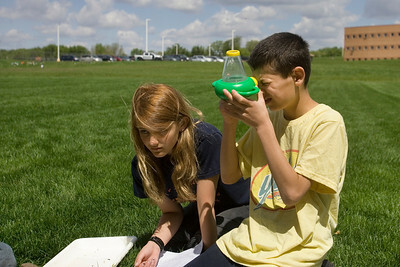 Mike Greene - mgreene@shawmedia.com Hannah Beardsley Middle School students Billy Keaty and Ashley Andrey use a microscope to take a closer look at critters found in a stream Tuesday, May 8, 2012 in Crystal Lake. The event, organized by seventh grade biology teacher Carol Sevrey and Friends of the Fox, gave students a chance to gain hands-on experience and apply skills learned in the classroom. Students at the event measured the physical, chemical, and biological conditions at sites along the stream. 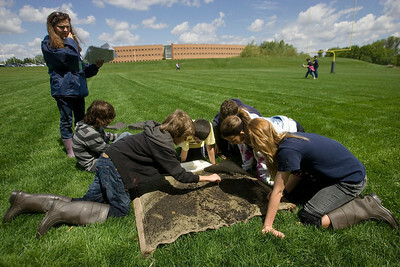 Mike Greene - mgreene@shawmedia.com Hannah Beardsley Middle School student Ashley Andrey (right) and her classmates search through a silt screen collected in a stream behind Prairie Ridge High School looking for critters present in the waterbed Tuesday, May 8, 2012 in Crystal Lake. The event, organized by seventh grade biology teacher Carol Sevrey and Friends of the Fox, gave students a chance to gain hands-on experience and apply skills learned in the classroom. Students at the event measured the physical, chemical, and biological conditions at sites along the stream, with results aiding research by Friends of the Fox. Mike Greene - mgreene@shawmedia.com David Rigby, educaiton outreach coordinator for Friends of the Fox, wraps up a water testing event with students from Hannah Beardsley Middle School Tuesday, May 8, 2012 in Crystal Lake. The event, organized by seventh grade biology teacher Carol Sevrey and Friends of the Fox, gave students a chance to gain hands-on experience and apply skills learned in the classroom. Students at the event measured the physical, chemical, and biological conditions at sites along the stream. 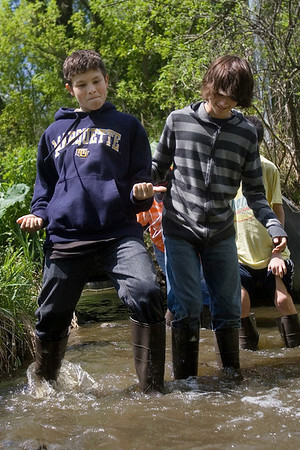 Mike Greene - mgreene@shawmedia.com Hannah Beardsley Middle School student Neal Schnoor dances while trudging through a stream with classmate Jacob Keller Tuesday, May 8, 2012 in Crystal Lake. The event, organized by seventh grade biology teacher Carol Sevrey and Friends of the Fox, gave students a chance to gain hands-on experience and apply skills learned in the classroom. Students at the event measured the physical, chemical, and biological conditions at sites along the stream. 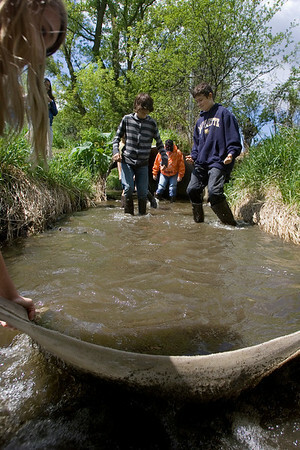 Mike Greene - mgreene@shawmedia.com Hannah Beardsley Middle School students Jacob Keller and Neal Schnoor trudge through a stream while trying to catch critters in a silt screen Tuesday, May 8, 2012 in Crystal Lake. The event, organized by seventh grade biology teacher Carol Sevrey and Friends of the Fox, gave students a chance to gain hands-on experience and apply skills learned in the classroom. Students at the event measured the physical, chemical, and biological conditions at sites along the stream. Mike Greene - mgreene@shawmedia.com Chaperone Janette Keller watches over a group of Hannah Beardsley Middle School students searching through a silt screen for critters found in a stream behind Prairie Ridge High School Tuesday, May 8, 2012 in Crystal Lake. The event, organized by seventh grade biology teacher Carol Sevrey and Friends of the Fox, gave students a chance to gain hands-on experience and apply skills learned in the classroom. Students at the event measured the physical, chemical, and biological conditions at sites along the stream. 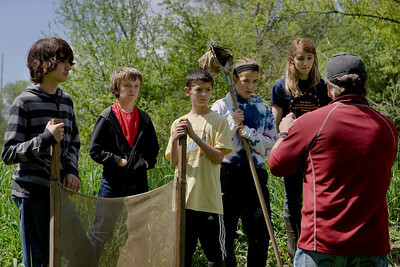 Mike Greene - mgreene@shawmedia.com Hannah Beardsley Middle School students Billy Keaty (center) and Jordan Blanco look for critters caught in a silt screen from a stram behind Prairie Ridge High School Tuesday, May 8, 2012 in Crystal Lake. The event, organized by seventh grade biology teacher Carol Sevrey and Friends of the Fox, gave students a chance to gain hands-on experience and apply skills learned in the classroom. Students at the event measured the physical, chemical, and biological conditions at sites along the stream. 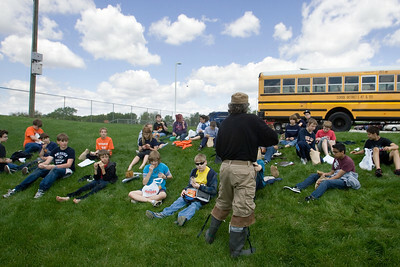 Mike Greene - mgreene@shawmedia.com Students from Hannah Beardsley Middle School listen to Mark Rigby, who assists Friends of the Fox, before testng the water in the stream Tuesday, May 8, 2012 in Crystal Lake. The event, organized by seventh grade biology teacher Carol Sevrey and Friends of the Fox, gave students a chance to gain hands-on experience and apply skills learned in the classroom. Students at the event measured the physical, chemical, and biological conditions at sites along the stream. 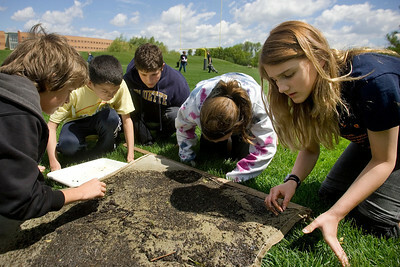 Hannah Beardsley Middle School students Billy Keaty (center) and Jordan Blanco look for critters caught in a silt screen from a stram behind Prairie Ridge High School Tuesday, May 8, 2012 in Crystal Lake. The event, organized by seventh grade biology teacher Carol Sevrey and Friends of the Fox, gave students a chance to gain hands-on experience and apply skills learned in the classroom. Students at the event measured the physical, chemical, and biological conditions at sites along the stream.